Finally, after a really, REALLY long and worrisome week at work AND at home, I've finally finished the Plait Cable Purse that I had started back in December. I haven't done any knitting or crocheting in about a week. And that is UNHEARD of for me! YIKES! Because upon waking at 6 am Thursday morning I received a phone call from my Dad saying he needed to go to the Hospital. I ended up taking him to the ER Thursday morning and they promptly registered him into the hospital to stay where he will be until hopefully only Monday. He has an intestinal blockage from the Arterial Bypass surgery he had back in November. I've been scared out of my wits. And needless to say, no crafting of any kind has been done of late. Plus on top of it all, I've been having horrible migrain-like headaches all week due to Sinus problems. UGH! After working all day I've just came home and crashed on the couch, barely able to read my emails and blogs because I feel as if my head is about to lift up from my shoulders and promptly explode!!! Anywho, on with the pics! I hope everyone else has been having a better, healthier week than i've been having! Krystal, I'm really sorry to hear about your Dad. I hope he's well soon. I'll be sending you hopes of good health and a speedy recovery. Take care of yourself. 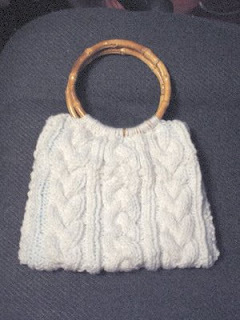 Lovely purse! Hope Dad recovers soon!! And you, too. I know how those sinus monsters get, I feel for ya!